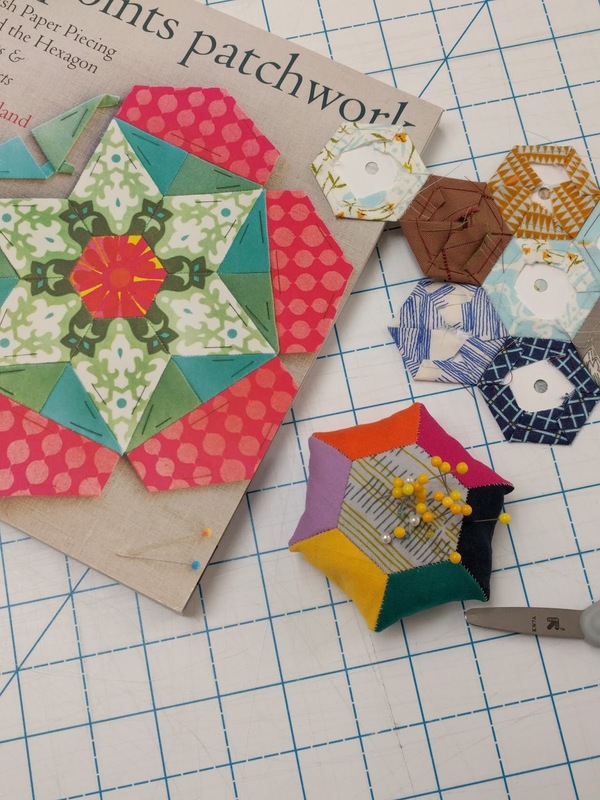 We are so glad you are ready to make your hexagon pincushion, thanks for stopping by! Center the hexagon templates on the fabric and pin through the small hole in the template to make it hold. You can trim the fabric excess if desired, be sure to leave 1/4 to 3/8" seam allowance. Trimming is optional and not necessary with the square and hexagon sets we gave out. 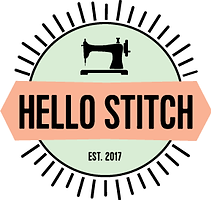 Thread baste the fabric around each template: (fold seam allowance over the edge of template, with needle and thread backstitch at each corner to secure as you go around the hexagon, folding and stitching as you go) do not stitch through the card stock. The templates can be re-used! 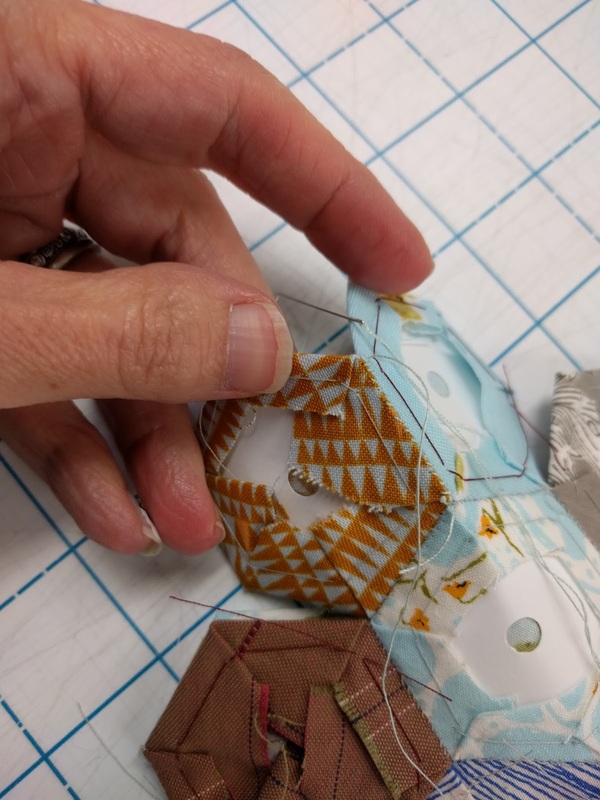 Once each fabric is secured to it's hexagon, you can play with the layout/design of your pincushion. When you find a design that you like, you are ready to stitch them together. 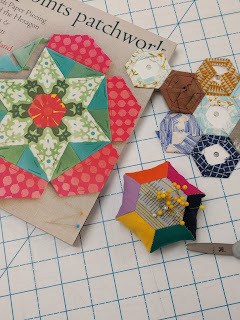 Using a whip stitch, stitch the hexagons together, into a flower shape (one center, and 6 around the center). 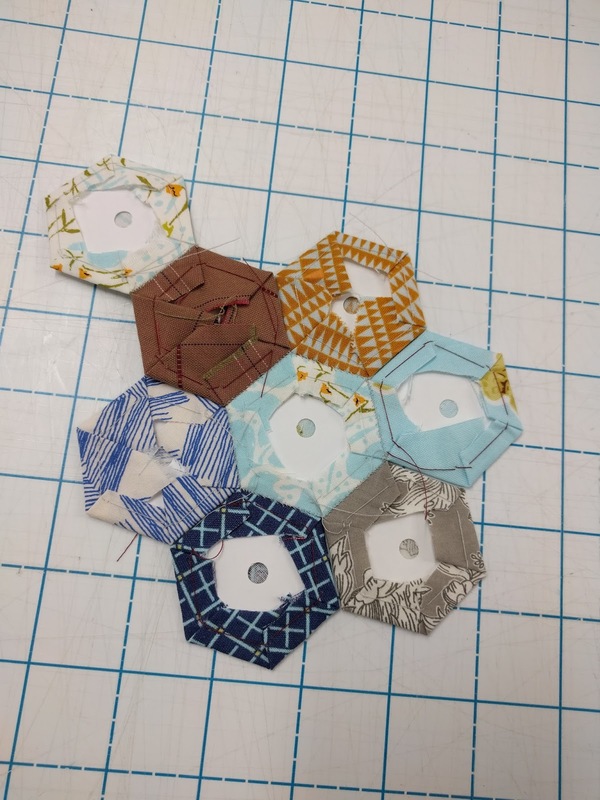 At this point, you will have stitched all the way around the center hexagon, and you can now remove it’s paper - a chopstick works great for this. Insert chopstick in the hole and pop out the paper. 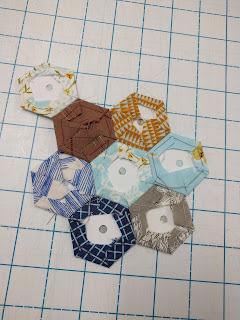 You can stitch the 8th hexagon to any of the 6 hexagons available now, or save the 8th until the end. In the photo below, we have stitched it on at this stage. 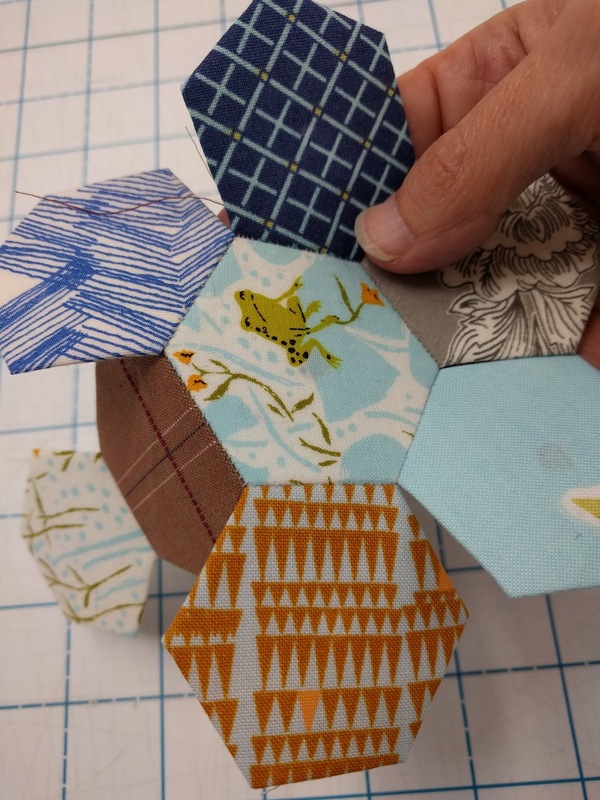 After you stitch a petal to each side of the center hexagon (see photo above), you can stitch the hexagons to each other at their sides (right sides together). See photo below. 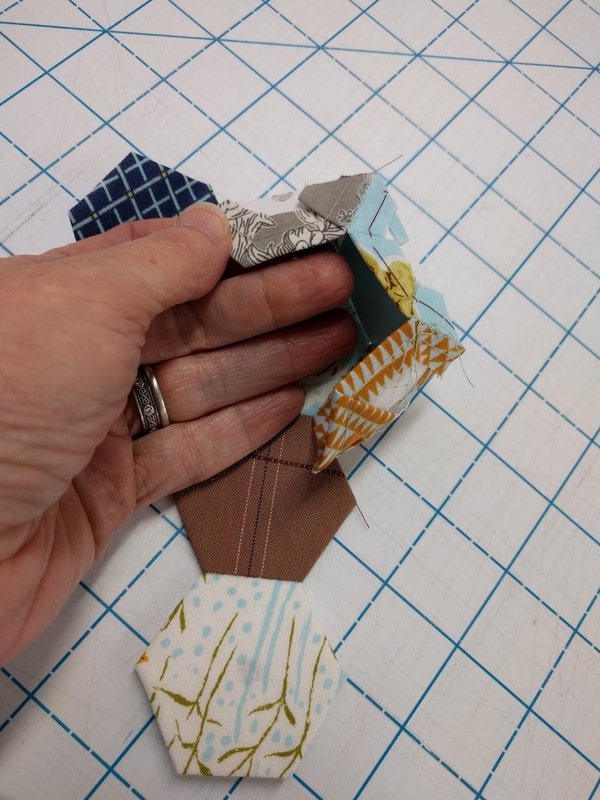 Next, bend the outer hexagons in half so that you can stitch the remaining sides together. It is normal to have to bend the paper - this step gets a little unruly, but you can do it. You can see the bending in the photo below. Now you have a hexagon space to fill with the last hexagon. Attach one side of the last hexagon (or maybe you already stitched it on as we described earlier). Remove all the papers, finger press down any seam allowances that have not been stitched together yet and turn right side out. Fill with walnut shell or rice to give it some heft. Walnut shell can have a tendency to "leak" so we also like to make a muslin pouch of it before stuffing it. A tiny bit of poly fiber stuffing in the corners helps define the points. Once stuffed to your satisfaction, whipstitch or ladder stitch the opening closed. We have a talented teacher, Carolyn Weil, who helps at our Handwork Meetup. She LOVES English paper piecing, and can also help you finish your project. The meetup is only $5 or free for members, every First Thursday from 6:30 to 8:30pm. Join us, it's always a fun time!